When scanning CDs, you'll get numbers for C1, C2 and CU. A properly recorded CD does not show any C2 errors, and especially not any CU errors. If you are getting C2/CU errors on pressed audio cds, then either the disc is heavily damaged due to scratches or finger prints, or the CD in question is intentionally damaged by the music industry (they call it "CactusData Shield 200" and claim that it were a protection against copying). 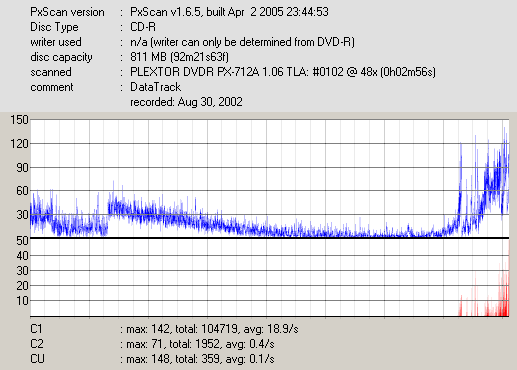 If a recorded CD-R looks like this, you should make a backup and throw the old disc away. Depending on the drive you are using and the exact type of the CD, you can perform scans at speeds up to 48x. However, some people claim that higher scan speeds lead to an inaccurate result.